Victor Emmanuel was born as the eldest son of Charles Albert, Prince of Carignano, and Maria Theresa of Austria. His father succeeded a distant cousin as King of Sardinia-Piedmont in 1831. He lived for some years of his youth in Florence and showed an early interest in politics, the military, and sports. In 1842, he married his cousin, Adelaide of Austria. He was styled as the Duke of Savoy prior to becoming King of Sardinia-Piedmont. He took part in the First Italian War of Independence (1848–1849) under his father, King Charles Albert, fighting in the front line at the battles of Pastrengo, Santa Lucia, Goito and Custoza. He became King of Sardinia-Piedmont in 1849 when his father abdicated the throne, after a humiliating military defeat by the Austrians at the Battle of Novara. Victor Emmanuel was immediately able to obtain a rather favorable armistice at Vignale by the Austrian imperial army commander, Radetzky. The treaty, however, was not ratified by the Piedmontese lower parliamentary house, the Chamber of Deputies, and Victor Emmanuel retaliated by firing his Prime Minister, Claudio Gabriele de Launay, replacing him with Massimo D'Azeglio. After new elections, the peace with Austria was accepted by the new Chamber of Deputies. In 1849, Victor Emmanuel also fiercely suppressed a revolt in Genoa, defining the rebels as a "vile and infected race of canailles." In 1852, he appointed Count Camillo Benso of Cavour ("Count Cavour") as Prime Minister of Piedmont-Sardinia. This turned out to be a wise choice, since Cavour was a political mastermind and a major player in the Italian unification in his own right. Victor Emmanuel II soon became the symbol of the "Risorgimento", the Italian unification movement of the 1850s and early 60s. He was especially popular in the Kingdom of Sardinia-Piedmont because of his respect for the new constitution and his liberal reforms. Following Victor Emmanuel's advice, Cavour joined Britain and France in the Crimean War against Russia. Cavour was reluctant to go to war due to the power of Russia at the time and the expense of doing so. Victor Emmanuel, however, was convinced of the rewards to be gained from the alliance created with Britain and, more importantly, France. After successfully seeking British support and ingratiating himself with France and Napoleon III at the Congress of Paris in 1856 at the end of the war, Count Cavour arranged a secret meeting with the French emperor. In 1858, they met at Plombières-les-Bains (in Lorraine), where they agreed that if the French were to help Piedmont combat Austria, which still occupied the Kingdom of Lombardy-Venetia in northern Italy, France would be awarded Nice and Savoy. The Italo-French campaign against Austria in 1859 started successfully. 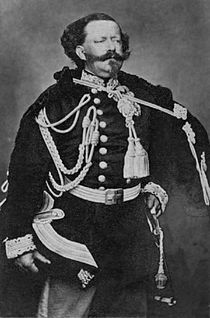 However, sickened by the casualties of the war and worried about the mobilisation of Prussian troops, Napoleon III secretly made a treaty with Franz Joseph of Austria at Villafranca whereby Piedmont would only gain Lombardy. France did not as a result receive the promised Nice and Savoy, but Austria did keep Venetia, a major setback for the Piedmontese, in no small part because the treaty had been prepared without their knowledge. After several quarrels about the outcome of the war, Cavour resigned, and the king had to find other advisors. France indeed only gained Nice and Savoy after the Treaty of Turin was signed in March 1860, after Cavour had been reinstalled as Prime Minister, and a deal with the French was struck for plebiscites to take place in the Central Italian Duchies. Later that same year, Victor Emmanuel II sent his forces to fight the papal army at Castelfidardo and drove the Pope into Vatican City. His success at these goals led him to be excommunicated from the Catholic Church. Then, Giuseppe Garibaldi conquered Sicily and Naples, and Sardinia-Piedmont grew even larger. On 17 March 1861 the Kingdom of Italy was officially established and Victor Emmanuel II became its king. Victor Emmanuel supported Giuseppe Garibaldi's Expedition of the Thousand (1860–1861), which resulted in the rapid fall of the Kingdom of the Two Sicilies in southern Italy. However, the king halted Garibaldi when he appeared ready to attack Rome, still under the Papal States, as it was under French protection. In 1860, through local plebiscites, Tuscany, Modena, Parma and Romagna decided to side with Sardinia-Piedmont. Victor Emmanuel then marched victoriously in the Marche and Umbria after the victorious battle of Castelfidardo (1860) over the Papal forces. The king subsequently met with Garibaldi at Teano, receiving from him the control of southern Italy. Another series of plebiscites in the occupied lands resulted in the proclamation of Victor Emmanuel as the first King of Italy by the new Parliament of unified Italy, on 17 March 1861. He did not renumber himself after assuming the new royal title, however. Turin became the capital of the new state. Only Rome, Veneto, and Trentino remained to be conquered. In 1866 Victor Emmanuel allied himself with Prussia in the Third Italian War of Independence. Although not victorious in the Italian theater, he managed anyway to receive Veneto after the Austrian defeat in Germany. The British Foreign Secretary, Lord Clarendon, visited Florence in December 1867 and reported to London after talking to various Italian politicians: "There is universal agreement that Victor Emmanuel is an imbecile; he is a dishonest man who tells lies to everyone; at this rate he will end up losing his crown and ruining both Italy and his dynasty." In 1870, after two failed attempts by Garibaldi, he also took advantage of the Prussian victory over France in the Franco-Prussian War to capture Rome after the French withdrew. He entered Rome on 20 September 1870 and set up the new capital there on 2 July 1871, after a temporary move to Florence in 1864. The new Royal residence was the Quirinal Palace. The rest of Victor Emmanuel II's reign was much quieter. After the Kingdom of Italy was established he decided to continue on as King Victor Emmanuel II instead of Victor Emmanuel I of Italy. This was a terrible move as far as public relations went as it was not indicative of the fresh start that the Italian people wanted and suggested that Sardinia-Piedmont had taken over the Italian Peninsula, rather than unifying it. Despite this mishap, the remainder of Victor Emmanuel II's reign was consumed by wrapping up loose ends and dealing with economic and cultural issues. His role in day-to-day governing gradually dwindled, as it became increasingly apparent that a king could no longer keep a government in office against the will of Parliament. As a result, while the wording of the Statuto Albertino stipulating that ministers were solely responsible to the crown remained unchanged, in practice they were now responsible to Parliament. Victor Emmanuel died in Rome in 1878, after meeting with Pope Pius IX's envoys, who had reversed the excommunication, and received last rites. He was buried in the Pantheon. His successor was his son Umberto I.
Maria Clotilde (1843–1911), who married Napoléon Joseph (the Prince Napoléon). Their grandson Prince Louis Napoléon was the Bonapartist pretender to the French imperial throne. Umberto (1844–1900), later King of Italy. Amadeo (1845–1890), later King of Spain. Oddone Eugenio Maria (1846–1866), Duke of Montferrat. Maria Pia (1847–1911), who married King Louis of Portugal. Carlo Alberto (2 June 1851 – 28 June 1854), Duke of Chablais. Vittorio Emanuele (6 July 1852 – 6 July 1852). Vittorio Emanuele (18 January 1855 – 17 May 1855), Count of Geneva. Vittoria Guerrieri (2 December 1848 – 29 December 1905), married three times and had issue. Emanuele Alberto Guerrieri (16 March 1851 – 24 December 1894), Count of Mirafiori and Fontanafredda, married and had issue. —Virginia Oldoini, Countess of Castiglione, who, as the mistress of Napoleon III, pleaded the case for Italian unification. Emanuela Maria Alberta Vittoria di Roverbella (6 September 1853 – 1880/1890). Vittorio di Rho (1861 – Turin, 10 October 1913). He became a notable photographer. Maria Pia di Rho (25 February 1866 – Vienna, 19 April 1947). Donato Etna (15 June 1858 – Turin, 11 December 1938). He became a much-decorated soldier. A daughter, perhaps named Savoiarda. She died as an infant. Knight of the Order of the Golden Fleece in 1841. Knight Grand Cross of the Order of St. Stephen of Hungary in 1869. Belgium: Grand Cordon of the Order of Leopold in 1855. Denmark: Knight of the Order of the Elephant in 1861. United Kingdom: Extra Knight of the Order of the Garter in 1855. ^ "Excommunicating Politicians". 27 September 2004. ^ Genealogical data from the Savoia page of the Genealogie delle famiglie nobili italiane website. Chisholm, Hugh, ed. (1911). "Victor Emmanuel II." . Encyclopædia Britannica. 28 (11th ed.). Cambridge University Press. Wikimedia Commons has media related to Vittorio Emanuele II.